Regardless of whether you consider the original World War II Jeep, the 1935 Chevrolet Suburban Carryall or something else to be the Adam of sport utility vehicles, the bottom line is the primordial soup of SUVs consisted pretty much entirely of two-door body styles. If you wanted the passenger loading and unloading ease of a four-door, you bought a passenger car. That’s just how things were. But as time went on, more and more four-door truck-ish wagons appeared, putting the squeeze on their less family friendly counterparts to the point that they’ve reached the brink of extinction; in fact, just two two-door SUVs can currently be bought new in the United States, the Jeep Wrangler and the Land Rover Range Rover Evoque…and even those have faster-selling four-door versions available! But on the way to the automotive endangered species list, there were quite a few duoporte trail-tacklers whose existences, particularly here in the U.S. (Read: Any moaning about our failure to include two-door versions of the second-gen-and-later Mitsubishi Pajero/Shogun and Land Rover Discovery Series 1 will not even be dignified with a response.) were so brief, unremarkable or both, that a lot of people have forgotten they even existed at all. It is for those folks we have corralled the following 10 trucksters who traded rear seat access for athleticism, aesthetics and, as history would decree, obscurity. After scoring home runs (or at least triples) in the sales wars with a pair of downsized passenger cars – the Mustang II and the LTD II – in the 1970s, Ford management of the 1980s figured it would try to work the same magic with its (at the time) lone North American market SUV, the Bronco. Using the compact Ranger pickup as a starting point, the Bronco II arrived for the 1985 model year to join the standard big Bronco, which would remain in production and based on the F-150. 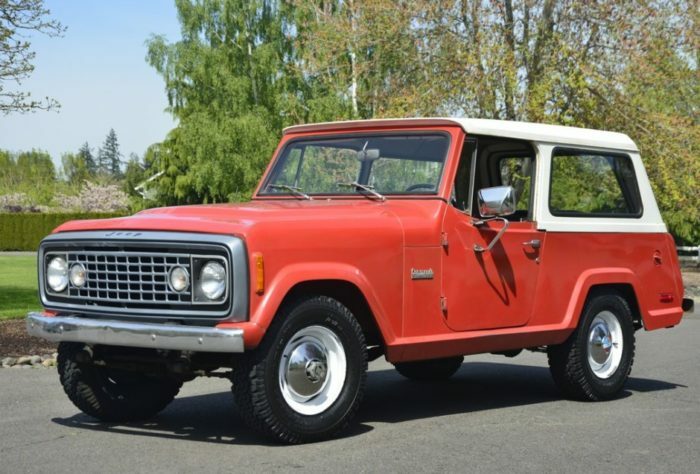 The Bronco II’s 94” wheelbase was just two inches longer than that of the 1966-’77 original, while designers made up for the lack of a removable roof by allowing the huge rear side windows to swing upward or be removed completely if ordered with the appropriate options and/or packages. Drivetrains were the Ranger’s optional ones: The 2.8L carbureted (later 2.9L fuel injected) Cologne V6 and, for ‘86 only, the 2.3L Mitsubishi 4D55T inline-four turbodiesel. The Bronco II sold reasonably well against Chevrolet’s S-10 Blazer and other adversaries, but its deadliest foe would come from within: The Explorer, which launched in the spring of 1990 and, though still an offshoot of the Ranger, featured an extra 8.1” of wheelbase in 2-door guise (with the extra interior space to go along with it), not to mention a four-door version that was longer and roomier still. No points, then, for guessing Ford’s main justification for retiring its lil’ buckaroo almost exactly the same time Explorer production began. 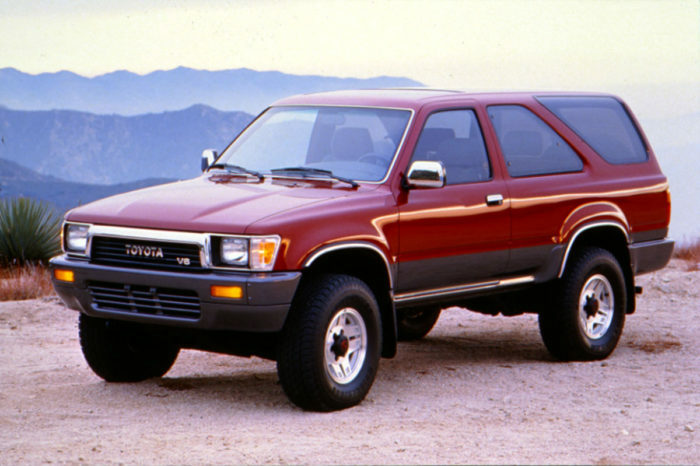 Like many SUVs when they were first introduced, the original Toyota 4Runner was built exclusively as a two-door. But when the second generation model arrived for the 1990 model year, the big news was the availability of a four-door version. Yes, a new two-door was also offered (with a fixed rear roof but a forward raked C-pillar similar to that on the first-gen’s removable top), but the four-door outsold it by massive margins worldwide, which led to Toyota discontinue exporting the sportier body style to the U.S. at the close of the 1992 model year, and axe it everywhere else (including Japan, where it was made for all markets and known, like all generations of 4Runner before and since, as the Hilux Surf) less than a year later. Compared to Jeep, Ford, International Harvester and General Motors, Chrysler was a bit late to the rough-and-ready 2-door SUV party (World War II era Dodge Power Wagon Carryall notwithstanding.). The Dodge Ramcharger, based on the contemporary D-Series full-size pickup, arrived for model year 1974, and was available with a removable fabric top, a removable hardtop, or no top at all. 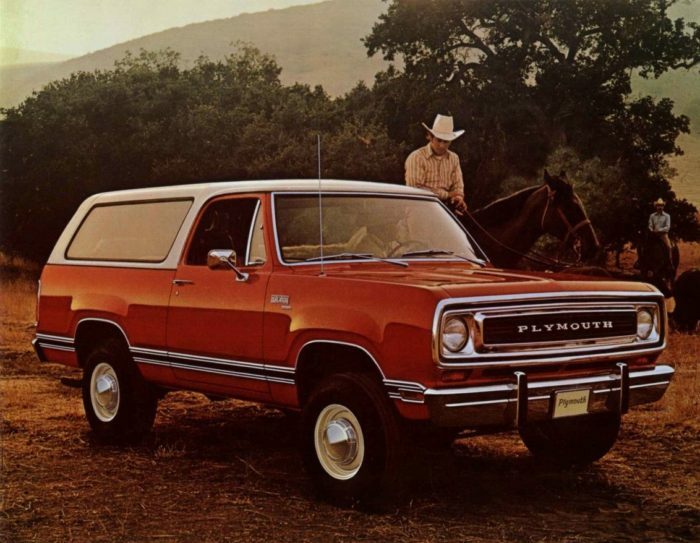 But much the same way GM offered its stump jumper in both Chevrolet Blazer and GMC Jimmy forms, the Ramcharger had a Plymouth companion called the Trail Duster, which was obviously a riff on the name of the fastback A-body Duster coupe. Aside from a different grille and some other trim items, it was identical to the Ramcharger, right down to the sizable menu of V8s and Chrysler’s trusty Slant-6 available under the hood. 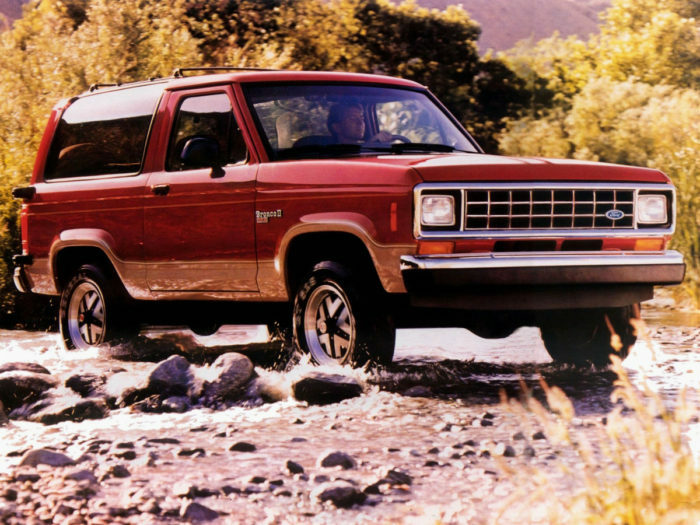 Both the Ramcharger and Trail Duster sold reasonably well, so much so that when the former was given a major facelift for 1981 (which, among other things, did away with the removable roofs), the latter was also updated to the new body. However, at the conclusion of the ‘81 model year the Trail Duster was no more, as were the company’s R-body full-size sedans, as Lee Iacocca pushed the Pentastar product portfolio toward smaller front-wheel-drive vehicles. When the rounder, more civilized second generation Isuzu Trooper bowed in 1993, the family-friendly four-door version understandably received the lion’s share of the attention. But there was still a two-door version available, offered exclusively in the sporting RS trim. Thanks to a wheelbase a whopping 17” shorter than that of the four-door, the RS was astoundingly agile on and off the road…though maybe a little too agile, as Consumer Reports alleged the four-door Trooper (which is theoretically a lot more stable thanks to the longer wheelbase) had a tendency to tip over during abrupt maneuvers. However, by the time those reports came out in 1996, the two-door Trooper was already about a year removed from being pulled from the U.S. market, which was hardly a shocking development given that it sold in numbers too miniscule to see with the naked eye. Lost of folks remember that the first generation Kia Sportage (which was also the first SUV from a Korean nameplate to be officially offered in the U.S.) was offered as a conventional four-door wagon. But few will recall that, between 1998 and 2002, a two-door half-convertible model was also offered. Both body styles used the same 2.0L 130 horsepower Mazda inline-four and choice of rear- or four-wheel-drive, though the ragtop used a frame with an 11.5” shorter wheelbase. Interestingly, all first-gen Sportages were based on the chassis of the contemporary Mazda Bongo, a forward-control van. 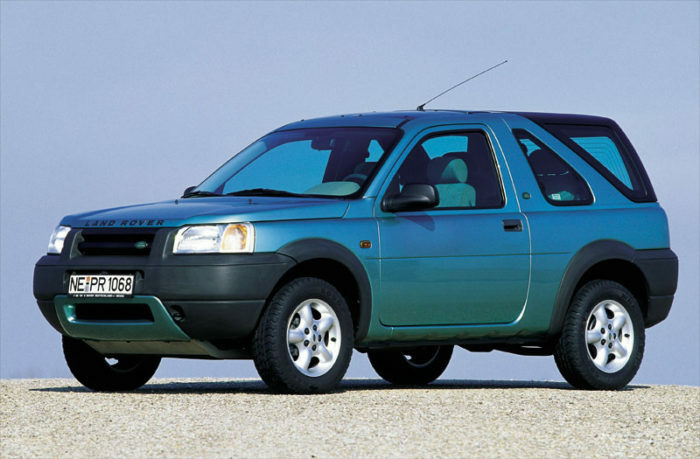 As the first of the compact, car-like Land Rovers, the Freelander ushered in a new era for British brand. And while the fixed-roof four-door naturally grabbed the lion’s share of Freelander sales, the two-door semi-convertible (which arrived in the U.S. for the 2003 model year, one after the four-door) provided American buyers who missed the Defender 90 with a sporty (or at least as sporty as a mandatory 175 horsepower 2.5L V6 and 5-speed automatic transmission power team could be), open air alternative to the fully-enclosed remainder of the company’s lineup over here. But when the similar looking but bigger and Ford-passenger-car-based LR2 (which was called Freelander 2 outside North America) bowed in 2006, the ragtop was gone, leaving the brand without a two-door for our shores until the Range Rover Evoque hit the scene in late 2011. 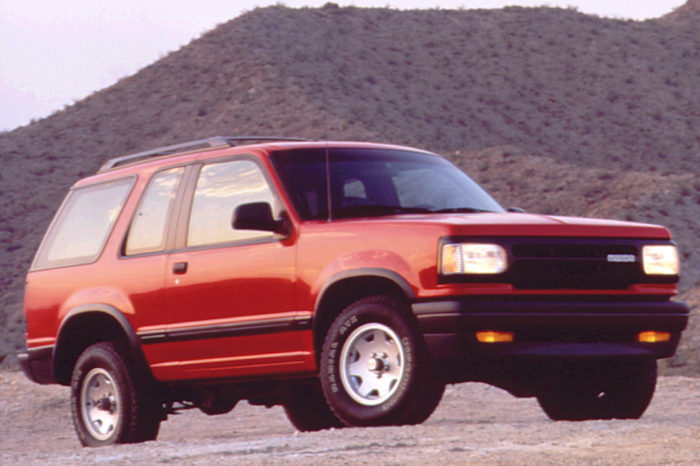 The Ford Explorer quickly established itself as a license to print money for the folks in Dearborn, but the Ranger-based wagon wasn’t sold exclusively with a blue oval; Mazda, which was under Ford control for decades, received a lightly restyled variant of the Explorer 2-door called the Navajo. 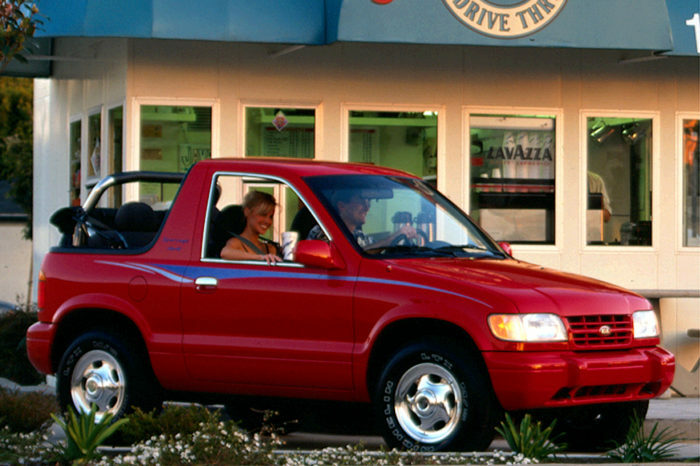 From 1991 (the year it was named Motor Trend’s Truck of the Year) to 1994, it gave U.S. Mazda dealers (The Navajo was never offered in Canada or any other country.) 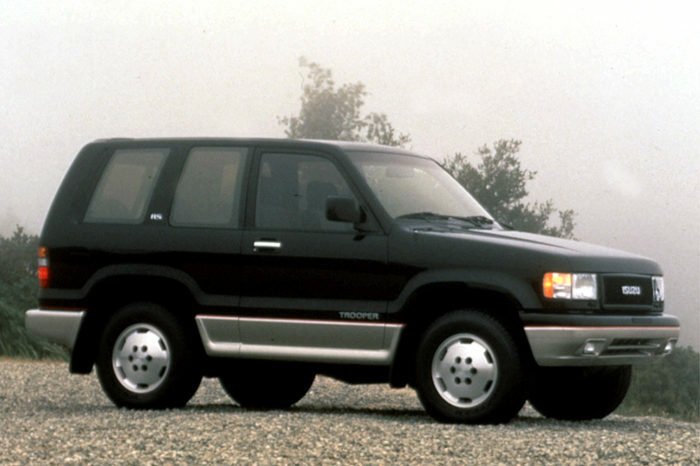 a means of cashing in on the early days of the SUV boom. Alas, it wasn’t enough of a cash cow to convince the beancounters in Hiroshima to keep it around for the Explorer’s big 1995 makeover. But wait, you’re saying, wouldn’t it have succeeded if they offered a four-door instead of or in addition to the two door? Well, duh, but Mazda’s rationale for only offering the two-door body was that they didn’t want to syphon sales away from their developed-in-house MPV minivan which, at the time, had a conventionally-hinged passenger side rear door (A driver side one was added for 1996. ), an SUV-like profile and optional four-wheel-drive with low range. In hindsight, Mazda put itself into a no-win situation, with true SUV market victory not coming for the Zoom-Zoom brand until the arrival of the Tribute (which was another clone of a Ford model, this time the Escape) in 2001. Daihatsu’s presence in the United States’ new automobile market was so brief (Just the 1988 through ‘92 model years.) that you are forgiven for forgetting that it ever came here at all. But it did, kids, and along with the 3-door hatchback and 4-door sedan versions of the bemusingly named Charade, the tiny Toyota subsidiary (which didn’t become wholly-owned until 2016) also sent its two-door SUV, the Rocky. U.S. spec models came with buyer’s choice of a folding soft top or a lift-off hardtop over the rear seating and cargo area, while a 94 horsepower 1.6L inline-four and 5-speed manual transmission served up thrust that was perfectly adequate for a mini 4×4 by the standards of the time. Unfortunately, “adequate” wasn’t enough to win over American buyers in droves. It also didn’t help that fellow Japanese minnow Suzuki was still selling Samurais (and Geo Trackers it built for GM) by the boatload, as was Isuzu with its Amigo beginning with the 1990 model year. One of the earliest Willys Jeep models developed specifically for peacetime/civilian consumption, the rear-wheel-drive-only, vaugely-passenger-car-ish-looking Jeepster, was offered for just three years (1948 to 1950). Fast forward to 1966 and Kaiser Jeep brought back the idea and basic shape (though not the exact same platform) as the Jeepster Commando, this time with a 4WD option and a Buick-designed V6 in place of the original’s flathead inline-sixes. Six years later and two years after the Jeep marque changed hands yet again, American Motors redesigned and reengineered the vehicle into the Jeep Commando. Easily identifiable by its squared-off front sheetmetal, this third evolution of the car-esque Jeep – which by this time was offered in convertible, pickup and enclosed wagon body styles – rode astride a three inch longer wheelbase (now 104”, hence the codename C104) to accommodate a trio of AMC engines: A 232 cubic inch (3.8L) inline-six, a 258 c.i. (4.2L) inline-six, and a 304 c.i. (5.0L) V8. Unfortunately for Commando fans, storm clouds in the shape of tougher emissions and safety standards were gathering on the horizon, and little AMC, forced as it so often was to allocate limited resources of both the human and material varieties to any given project, retired the model altogether at the end of the 1973 model year having produced just 20,223 examples. 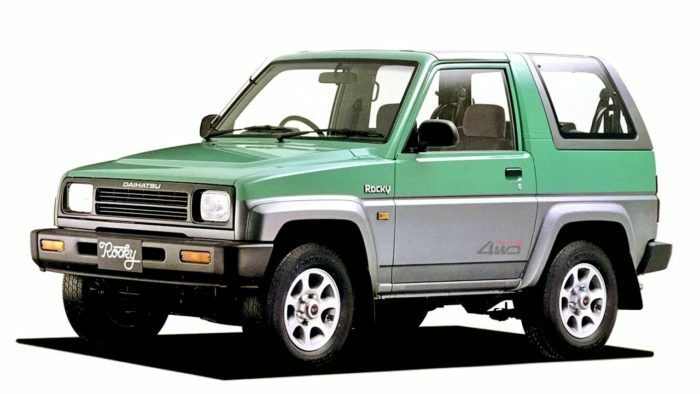 The first generation Isuzu Rodeo (the SUV, not the JDM name for the Pickup based on the same platform; the home market name for the SUV was the MU, which is short for – and we swear we aren’t making this up, because Japan – Mysterious Utility) spawned a shorter, semi-convertible two-door version called the Amigo here in North America. Its five year run came to an unceremonious end at the close of the 1994 model year and, given the unmistakably downward trajectory of two-door SUV sales in this country, it was easy to assume that it was never coming back. Except that’s exactly what happened for 1998, as rounder, second generation renditions of both the Rodeo and Amigo arrived on the scene. Unlike the original, the new Amigo (which was pitched with a delightfully earwormy spoof of the classic Slinky commercial…though as Slinky spot spoofs go, it still has to kneel before the markedly more fibrous one from Ren & Stimpy) was available with a V6 (specifically a 3.2L piece rated at 205 horsepower) in addition to the base inline-four, and starting in 1999, a fixed rear hardtop body style was also optional. 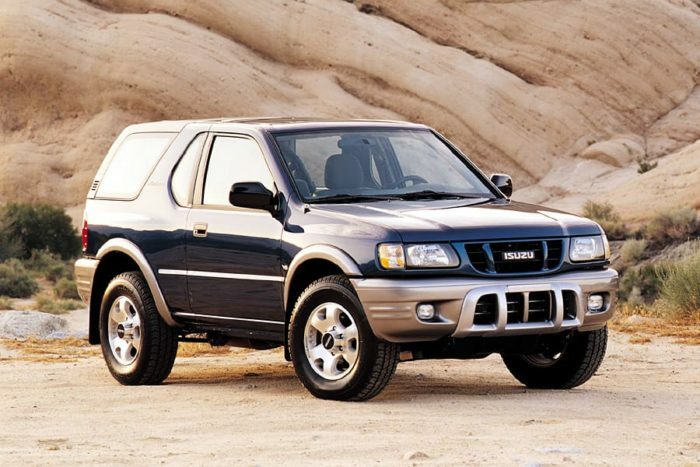 The vehicle’s name switched to Rodeo Sport for 2001, the same year the rear-drive-only four-cylinder became available with a 4-speed automatic transmission. Unfortunately, the new name and broader selection of features wasn’t enough to spare the model from execution at the end of 2003, one year ahead of the four-door Rodeo.